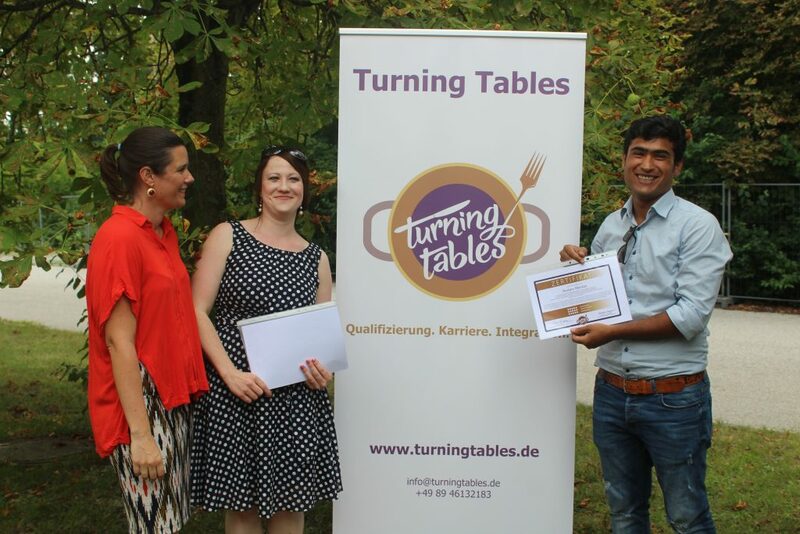 Turning Tables is a social business that is financed through grants, sponsoring, donations and cooperation agreements with industry partners. Our goal is to intensify our cooperation with partner organisations from the hospitality sector, to become financially independent. However, currently our placement income is not enough to cover our operating costs. That’s why we need you – to continue our work and successfully integrate refugees in Germany. Our work supports refugees to build up their own, independent future in their new home – and your donations enable us to do so. We thank you for contributing and being a part of Turning Tables. We are a team of international experts with various backgrounds. What connects us is our vision of an inclusive, versatile and strong society, to which everyone has the chance to contribute and thrive. We know that every person brings different skills and knowledge to the team, and that we can only gain from having a versatile team with a diverse professional background, age or life experience. There’s always something to do, and we can use every helping hand. No matter if its every day, for two hours each week or only occasional, to support us with certain events – if you want to get involved, please contact us.